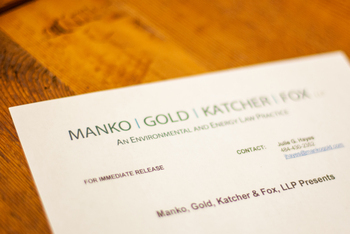 Manko, Gold, Katcher & Fox attorneys Todd Kantorczyk and Diana Silva presented “Managing Your Liabilities and Risks: Today and Tomorrow,” on Wednesday, July 18, 2018. Brett Slensky, Environmental, Health and Safety Counsel for Saint-Gobain Corporation rounded out the panel. The program was part of the half-day Health, BioTech & Pharma Law CLE Institute in King of Prussia, PA sponsored by the Greater Philadelphia Chapter of the Association of Corporate Counsel (ACC).